Tuesday, September 4th, 2012, 12:07 am. 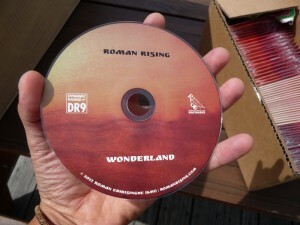 Wonderland is here. What an effort it’s been! While Wonderland is a solo album, it is unmistakably a collaborative effort. Featured on the album are twenty-six other musicians, most of whom I’ve worked with in other groups. These performers are: Carlos Adames (cajon, percussion), Glenn Asch (viola), Kaita Bliffert (vocals), Michael “Bootz” Bootzin (guitar), David Burda (hurdy-gurdy), Stuart Dove (guitar), Jahmes Finlayson (claps), Aaron Gardner (sax, flute), “Doc” Jeff Green (guitar), Emily Jansen (vocals), Kirsten Jermé (cello), Matan Koplin-Green (drum kit), Jeremy Kuzniar (drum kit), Marie Kuzniar (violin), Annan Lomotey (organ), Augustin Magdinier (drum kit), Colin O’Brien (banjo, shoe-clad feet), Julio Pabon (percussion), Dumah Saafir (claps), Oumar Sagna (percussion), David Stocker (throat voice, percussion), Kristin Urban (vocals), David Wake (organ), Holly Wake (vocals), Jodi Westmore (vocals), and Matthew Wilson (guitar).